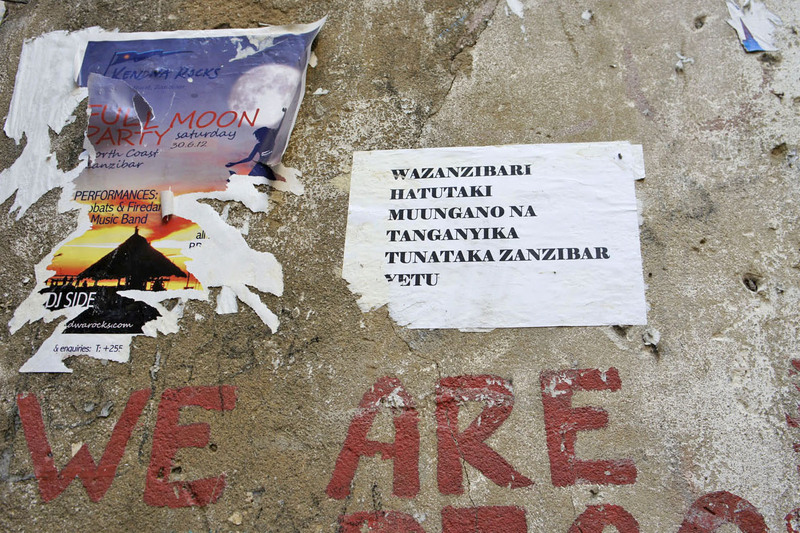 The Tanzanian archipelago of Zanzibar has experienced three anti-government protests so far this year; the latest, in mid-October, saw one police officer killed, roads blocked and shops closed across the capital, Zanzibar City. The group behind the demonstrations, Uamsho (the Association for Islamic Mobilization and Propagation), has plastered messages across the capital agitating for the archipelago’s independence. One such message, "if the coat doesn't fit, take it off", refers to disbanding the United Republic of Tanzania, which was born out of the 1964 union of Zanzibar and the mainland area of Tanganyika. The most recent unrest began when Uamsho supporters claimed their leader, Sheik Farid Hadi, had been abducted by government forces - a charge the police denied. Posts on Uamsho's Facebook page threatened attacks against Christians if Hadi was not released; he resurfaced on 16 October, three days after his disappearance. Established as an Islamic NGO in 2001, Uamsho has since grown radicalized, gaining popularity among disappointed supporters of the largest opposition party, Civic United Front, which formed a government of national unity with Tanzania’s ruling party, Chama Cha Mapinduzi (CCM), in 2010. Uamsho was also involved in two other protests earlier in the year. The Tanzanian government has taken a strong stand against the riots. "The government will not tolerate some few individuals threatening other people or using religion to disrupt the peace and harmony which the country has enjoyed over the past 50 years," said Emmanuel Nchimbi, the Minister for Home Affairs, at a recent news conference. Analysts say the violence is fuelled by unemployment and lack of education among young people; youth unemployment in Zanzibar stands at about 20 percent. "The youth are a time bomb. We have many unemployed, uneducated young people. They are easy to motivate into action, and they don't fully understand what they are doing. This is why at least 70 percent of the rioters were young men, many of them under 20 years old," said social scientist Khamis Said, a researcher of social issues in Zanzibar. "Torching of bars, churches and government property, stealing of crosses - this is all against Islam, but the youth are uneducated." He added that a proposed new national constitution would go some way towards clarifying Zanzibar's place within the union. The chairman of Uamsho's board of trustees, Abdulrahim Salim, says the organization is looking for peaceful ways to gain full independence for Zanzibar. He denied Uamsho wants Zanzibar to be an Islamic state. Former chairman of the Zanzibar House of Representatives Ali Mzee Ali says the islands must remain peaceful to sustain their economy. "Tourism is a major contributor in our budget, and it is dependent on peace," he said. "We are part of the East African Community, and if one part is not stable, it will of course affect all the other members," he added. Abdullahi B Halakhe, a Horn of Africa analyst with the think tank International Crisis Group, says Tanzania's reputation as one of the region’s more stable countries will be at risk if it fails to deal with ongoing problems both in Zanzibar and on the mainland. Protests also broke out in Dar es Salaam in mid-October following the arrest of influential Muslim cleric Sheikh Issa Ponda; those protests are thought to be unrelated to Uamsho. "Tanzania is always held up as a golden standard by which the other African nations are judged. Despite having a hundred ethnic groups, the country has enjoyed long and uninterrupted peace. But [with] the impending transitional election, where for the first time the ruling party - CCM - is facing a serious challenge, combined with the discontent from Zanzibar... we are witnessing unease," he told IRIN via email. He added that organizations like Uamsho could inspire similar groups in the region: "The threat of Zanzibar leaving the union will have huge implications that will transcend Tanzania. Secessionist movements like the MRC [Mombasa Republican Council] will obviously be emboldened." The MRC is a group based in Mombasa that is calling for the secession of the Kenyan coast area. Halakhe warns that the central government in Tanzania must handle the Uamsho matter carefully to prevent tensions from escalating. "The centre needs to appreciate issues raised by the predominantly Muslim coastal Swahili population are genuine, and cannot be wished away lightly," he said. "As such, the central government… needs to be seen to be trying to address these issues in good faith. Any attempt to gloss over the issue could be counter-productive." Said says that unless the government opens communication channels with Uamsho, the unrest will continue: "We need to have more dialogue between the different parties. If this is not done, we can expect more riots," he said.